March 2017 – Life Is Such A Sweet Insanity. Sleet is pelting against our windows. The wind is whipping. The creek in the backyard is barely holding its own within the confines of its banks. Ah, the joy of spring in Central New York. My kindergarten teacher, a woman by the name of Mrs. Mosher, once told us how March comes in like a lion and goes out like a lamb. I never really understood what that was suppose to mean since we’d often have snow on the ground and how in the world were lambs suppose to do their spring like thing if there’s snow on the ground? Of course, Mrs. Mosher also told my parents that I was probably mentally retarded and wouldn’t amount to much. My mother resisted the urge to show her my consistently top notch report card for the first few years of my primary years. I didn’t color in the lines. I didn’t really want people around me that much, I tended to play alone and in my own little world, I burped in appropriately and one time I was spied drinking out of the sink in the bathroom because I was thirsty and asking for a drink of water and I was told that it wasn’t time to drink water. Oh, one more lingering nugget of kindergarten fun, I would never stay on my rug during nap time. Do children still take naps in kindergarten? I was always thankful we didn’t have bomb raid drills during nap time, though looking back it would have made sense because in our school you were to get under your group table and put your nap rug over the back of your head. I can remember it like it was yesterday. They called them bomb raid drills but I think we were doing nuke drills, because there was a fairly new nuclear plant not too far away at the time. In first grade we just sat under our desk during these drills. I was so thankful that the desk was going to save me from a bomb. As the spring time sleet and wind pelted the house last night I dreamed of a high school classmate (actually she was a year behind me) that I knew only casually. 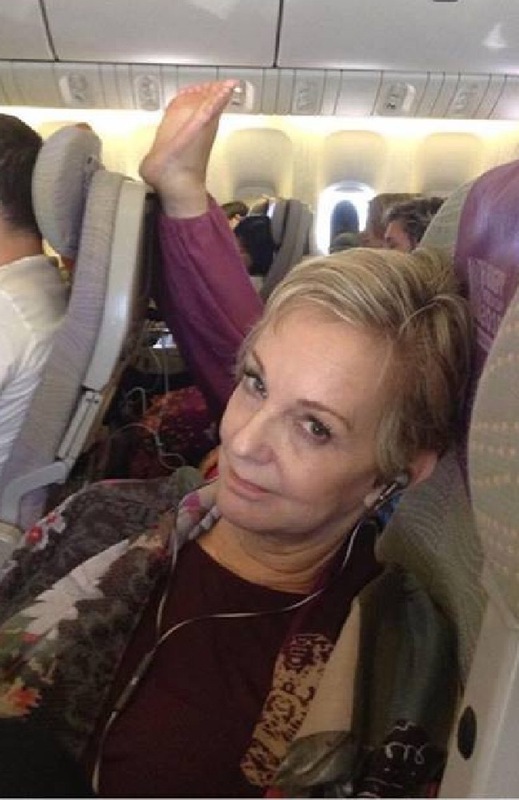 No idea why I dreamed about her but I stalked her on Facebook to see if she is still alive and she is. She hasn’t changed much in 30 years, either! Good for her. She was just there in the dream. Nothing of real significance. I am anxious for real spring-like weather to get here. I went flying last night and it felt a little spring like, though the delay in spring weather is probably good for my last two weeks of recovery from my surgery. But I’ll be happy when I can go outside and enjoy the warmth of the sun on my face. I just made my first flight video using Final Cut Pro X. It looks good on my computer but it’s in the process of doing some “sharing” voodoo in the background so I don’t know how it’ll look once my ISP scans it for ad revenue opportunities, then Google and Facebook look at it for ad revenue opportunities and then I start getting Amazon suggestions to buy an airplane. Isn’t the Internet grand? Especially when the U.S. Government is involved? A group of people that have absolutely no idea how any of this works. They just want the donations from the big companies. The world runs on green. Correction, the U.S. runs on green. Thank goodness Facebook has added random colors to posts. I think I’m tired. Be good to one another. My mind was focused on productivity today and it was a very successful endeavor. I’m feeling great. I feel like a new man. I dressed nicely for work, had a little incense burning and some soft music in the background. I shortly found myself in the zone for writing code and I wrote a heck of a lot of code today. Sometimes the stars just have to align. Maybe it’s the old style 1984 keyboard I use. Who knows, I’m not complaining. Follow Up 1 of 2. <i>This could be considered a TMI blog entry. I share this information for others that have a similar issue, as I found reading the experiences of others to be beneficial to keep my spirits up during my experience. I won’t be offended if you move on without reading.</i>. So today I visited the very capable urologist that performed the repair surgery to my urinary system at the beginning of this month. The official procedure is called a urethroplasty. Six centimeters of tissue was taken from the inside of my mouth and used to reconstruct a damaged, scarred area of my urethra. The scarring has been there since 1980 or so. I’ve had two catheters since the surgery on the 3rd of March. A Supra-pubic catheter was inserted through my abdomen on the 28th of January (and was replaced during the second surgery). Originally placed to allow my natural parts to calm down and stop the scarring process, the Supra-pubic catheter acted as a backup in case the second catheter, a regular indwelling Foley catheter that makes most people cringe, was installed during the March surgery. That has been my means of urination for 25 days. The urologist took some X-rays with contrasting fluid in my catheter, around my catheter and in my bladder. And then before I knew it, the catheter was removed and the doctor had a huge smile. “The graft site is not leaking and looks wonderful. Look at that.” He showed me a picture of a normal looking urethra, something I haven’t had in 35 to 40 years. “You have no strictures”. I was then expected to urinate using my own parts while laying on a bed under an X-ray machine with four onlookers of the process. I couldn’t do it. Nope. So they filled my bladder with saline solution to the point of where I thought I was going to explode, he saw enough on the X-ray machine to confirm everything was good and then I peed into a special toilet that measured volume, velocity and the like. Honestly, I broke all previous records in the doctor’s office. Ever. The last record was a man that could pee 40 ml/sec. I went off the chart at 55 ml/sec. I emptied nearly 700 ml of fluid from my bladder in just over 10 seconds. The Supra-pubic catheter will remain in place for another week. For the next seven days I urinate like a normal guy, and then I unplug this little tube hanging below my belly button to confirm that I am emptying my bladder. If I’m not emptying my bladder, there’s a problem. So far, I’ve had 14 drops of urine fall from the catheter tube after going the bathroom. Not even negligible residual urine. The doctor is confident that things are good to go. There was a worry of incontinence, since my scarring was so close to my bladder, but I can easily keep everything under control. Since my bladder hasn’t had to store anything since January, it’s a little weird having that feeling in my gut again, but I’m getting used to it. The doctor says my bladder will lose some of its muscle tone, as I used to have to push REALLY hard to urinate before this operation. As long as I can keep things at 18 ml/sec or higher, I’m good. And he thinks that’s not going to be a problem. The Supra-pubic catheter comes out next Tuesday. I then have follow up appointments in July, November and then next March, just to make sure everything holds in place. I cried with happiness, even though I’m still on healing restrictions, including absolutely no sexual activity for three more weeks. No heavy lifting. Keep your precious cargo supported with good underwear. No straddling anything for at least three weeks, longer if possible. I’ve made the decision that I’m going to replace my long-distance cycling with swimming this summer. And as soon as I have the all clear, I’ll be lifting some weights again. I feel like a Superman. It’s time to start acting like one again. 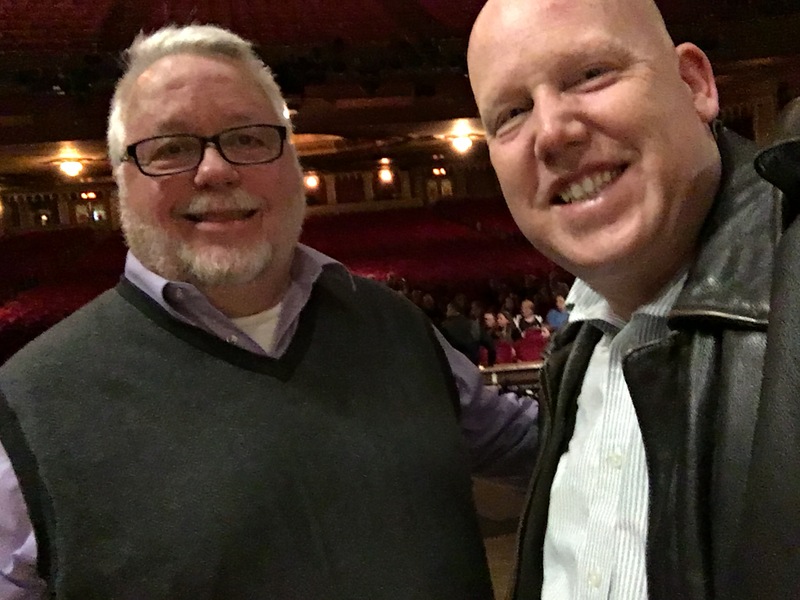 Earl and I attended “Wicked” last night at the Landmark Theatre in Syracuse, the second to last performance of this tour in the Salt City. The show was magnificent. Honestly, we both enjoyed the show more than when we saw it on Broadway back in 2011. The cast, the lighting, the energy, the sound, the entire performance was top notch and worth every penny we spent on tickets. After the curtain calls and the standing ovation, the cast came back on stage, asked everyone to settle down and explained about Broadway Cares. The Mission Statement of Broadway Cares (courtesy of their website). The leads announced that if each attendee in the audience gave just $3 on their way out of the theatre last night, they would raise $8,000 for this worthy cause from that one performance alone. To me, that’s quite awesome. You see, as a gay man in my late 40s I’ve been to too many funerals of those that have died for AIDS and other HIV related illnesses. I have a concern that today’s generation doesn’t realize the impact that AIDS and HIV had on the world, let alone the gay community, 25-30 years ago. Many think that they pop a pill once a day and they’re impervious to HIV. While there are thousands of people that live their lives with HIV, it’s still not something that should be taken lightly. We’ve made amazing strides in treatments and keeping things manageable, but with the turmoil in health care funding currently taking place in the United States, things could get much uglier, really fast. As the cast talked about Broadway Cares and encouraged the audience to donate on their way out of the theatre, there was talk about some swag with certain contribution amounts. Earl and I spoke briefly and decided that we would make a contribution, we weren’t really concerned with the swag, we just wanted to make the world a better place and this was a really good avenue. 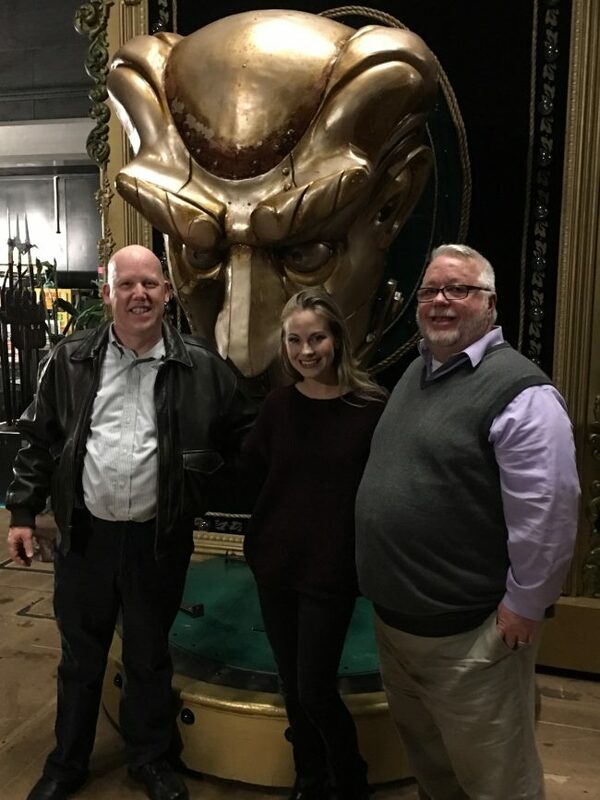 On our way out, as we stopped to make our contribution with a costumed cast member, we were asked if we wanted to join the backstage tour of the Landmark Theatre and the behind the scenes magic of the show. 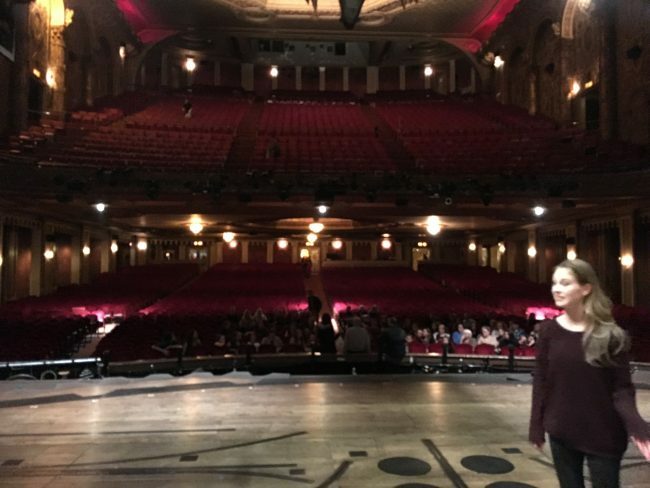 The tour was led by Kristen Martin, the talented actress that plays NessaRose, who becomes “The Wicked Witch of the East”. We learned all about her special wheelchair that she uses for the majority of the production and a bunch of other abracadabra to make Oz seem so magical. The backstage tour was longer and more in-depth than I expected. Pictures were forbidden outside of two specific locations along the tour, in the middle of the stage looking out on the seating area and in front of the great Wizard of Oz. 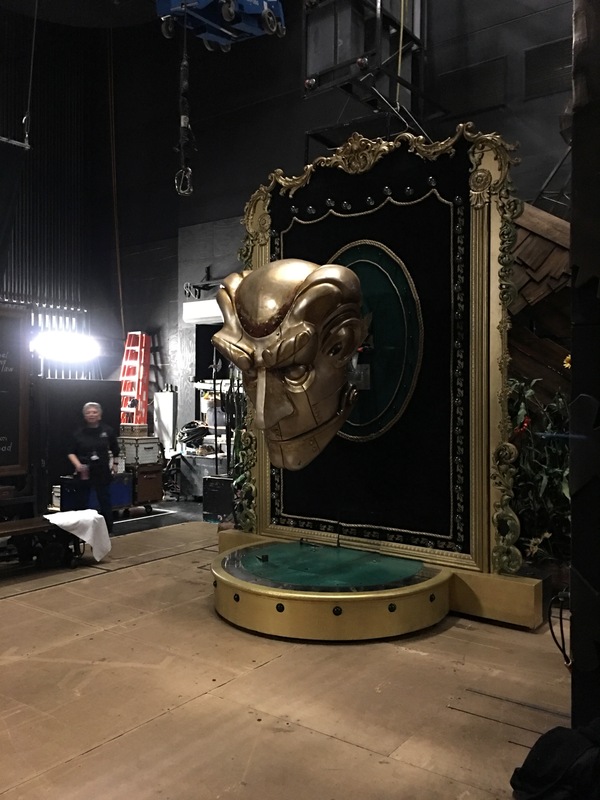 The Landmark Theatre is a relatively small theater and the touring company was barely able to squeeze everything necessary into the backstage area to make things happen. As productions get bigger, some of the older theaters require some creativity to make all of that magic you see on stage. We really enjoyed the tour and seeing some of the backstage magic. But more importantly, Earl and I agreed that we were two lucky guys to be able to contribute to “Broadway Cares”. I still haven’t adjusted to Daylight Saving Time. I try to go to bed earlier but I just lay in bed awake. I try to get up early and I end up sleeping late. I need to give it a couple of more weeks. Maybe after the surgery recovery I’ll feel more assimilated to those around me.